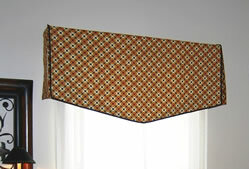 This project creates a very nice looking no-sew valance, that few people will recognize as no-sew. I think the look of a pleat at the corner helps add some detail, making it look more difficult than it really is. What’s best is it is made out of 5 easy pieces. There is the front, two side flaps and two inside flaps to hide where the front and sides come together, giving the look of a pleat. 1. First determine the shape of your valance. For instance, you could simply have a flat bottom edge where I decided to angle mine. Your options are limited to what you can achieve by folding your fabric along the bottom edge to the inside of the valance. 2. Next figure out the size of your valance. 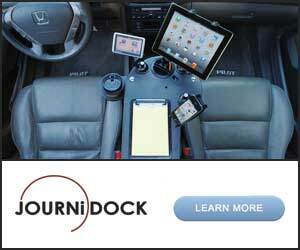 Do you want it a couple inches wider than the window or the drapery rod? And for height, generally you mount a valance at least 4” above the window or a rod. For my window, 4” above the rod then down 24” was just about right. I used a 1×6 for my valance because I needed the valance to be out far enough from the drapery fabric. If you are going over a plain window, a 1×4 will give you enough depth. All of my measurements are using a 1×6. 3. 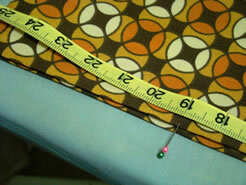 Determine how much fabric you need by adding your length plus 1” to wrap over the 1×6, then double that measurement. I doubled the fabric to self line all the pieces. You will also need side panels and corner panels that will require another approximately 36” wide by the same length as your valance fabric. 4. I started by cutting my main front panel to the width of the 1×4 plus 3”. The length was the length of the front panel plus 1”- doubled. 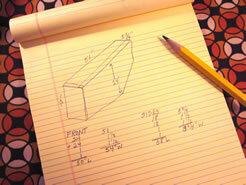 I cut my two side panels the depth of my 1×6 plus 3” and to the length of my front panel plus 1” – doubled. I also cut two corner pieces exactly like my side pieces. 5. Once all your pieces are cut, move to the ironing board. 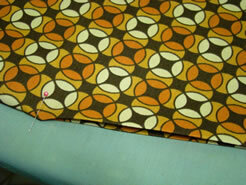 Fold over the side edges on the front panel 1 ½” and iron to the inside. 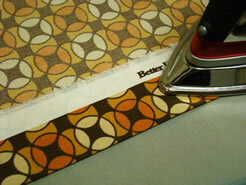 On the two side pieces and two corner pieces, fold the side edges in 1 ½” as well and iron down flat. 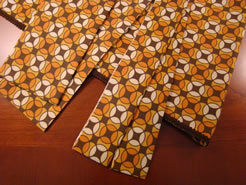 Then fold all of the pieces in half bringing the bottom edges up to the top edge and iron in the fold. 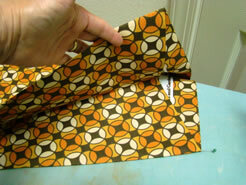 Pull the two corner pieces aside and fold them in half lengthwise with sides meeting sides and iron in a nice crease. This will help the pieces fold around the 1×6 when it comes time to attach them. 6. If you’ve decided to go with a straight edge along the bottom, skip this step. To create a point like I have on mine, measure up on the side, how much shorter you want the side of the panel to be and mark it with a pin. 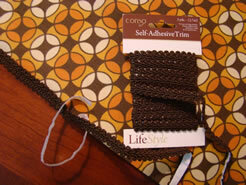 Mark the center of the bottom edge of the valance with a pin as well. Then, fold the remaining fabric along the bottom edge up and into the middle of the valance with the new folds creating a straight line from the bottom pin to the side pin on each side. This will create the pointed bottom edge. 7. 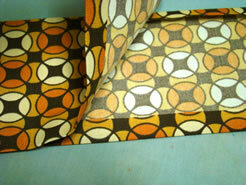 I used Fabri-Tac along all of the folds and seams to hold everything together nicely. It really works great. 8. My favorite part of the whole project is the self adhesive trim. This stuff is fabulous. It comes in beaded fringe, rick rack, braided trim like this one and you just pull off the paper backing and stick the trim in place. No sewing, no gluing, it can’t be beat! I used it to outline my front panel only. 9. 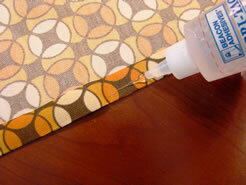 Once all of your pieces are put together, drag out your staple gun and attach the pieces to the 1×6. The corners go on first, and just fold the 1” over lap over the board and fold the corner like you would a gift and staple down flat. Add the end pieces and then the front panel. Make sure to use enough staples to give the top a nice finished appearance. To mount the valance over your window, first place the “L” brackets so the top of the “L” is at 4” above the window or the drapery. I usually mount the “L” brackets in line with the edge of the window on each side. If your valance is 60” or longer, you should use a center “L” bracket as well. 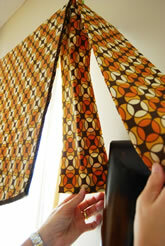 Next, set your finished valance on top of the “L” brackets centering it with the window. Now, screw through the holes in the “L” bracket into the wood valance board to secure the valance in place. This shot shows you how the pieces look when they are attached to the top valance board. You can see that the corner piece has to go first, then the sides and front. I promise this will make a huge difference in the appearance of your room, and no one will have any idea that you put it together with glue and staples! !